9 Sep 2018, 7:10 p.m.
On Saturday 28th July this year, I was at a party and telling my friends about the holiday we'd just returned from: a ten-day expedition cruise around West Spitsbergen, the largest island of the archipelago, including many hikes on land and a journey northwards into the pack ice. Weren't you scared of polar bears? they asked. Oh, polar bears almost never attack people on Svalbard, I airily assured them. There are around 3000 of them in the area, but so few people that encounters are quite rare, and everyone is prepared to deal with them. Besides, every time we tourists went out on Zodiacs or onto the land, we were accompanied by armed and trained guides to make sure we were safe. That very same day, a polar bear guard from a different cruise ship was attacked by a bear on land. He suffered head injuries, and the bear—which was not frightened off by a flare—had to be killed. The ship in question, the MS Bremen, had been sailing the same route as our ship, the M/V Plancius. It's a bigger vessel (155 berths versus 116), but both make 'expedition' cruises rather than the more traditional type focussing on comfort. Unlike the M/V Plancius and its owner, Oceanwide Expeditions, the MS Bremen and Hapag Lloyd Cruises don’t belong to AECO. That meant that they didn’t have to reserve different landing spots and time slots in the same way as we did, and they kept showing up behind us while we were making our excursions on land. There was a lighthearted annoyance towards the Bremen on board our ship; it was as though they were chasing us. The northernmost island of Svalvard is Rossøya. It's a speck of land, essentially a rock, and it seemed very unlikely either that the MS Bremen's passengers would make an excursion there, or that no one would notice a nearby bear. 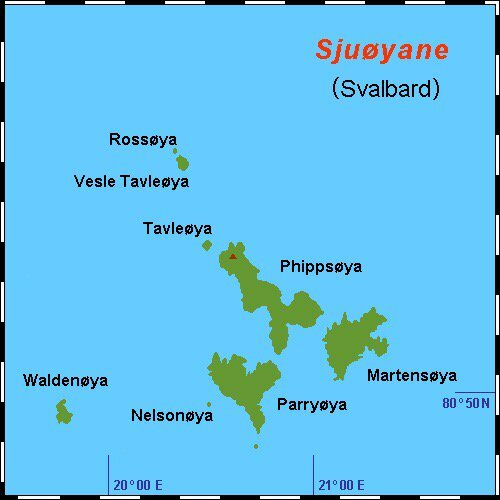 Map of the Sjuøyane by Hobe / Holger Behr, from Wikimedia Commons. Rossøya belongs to a group of islands called the Sjuøyane, or Seven Islands. Our ship had also visited the area, in particular the larger Phippsøya. I thought it a much more plausible destination for the MS Bremen—except that to land on the island would have been a terrible, dangerous idea. If they weren't directly on the beach, they were certainly somewhere on the island, so our plan was definitely NOT to land but to make a Zodiac tour to the island's small, sheltered bay in hopes of seeing them. 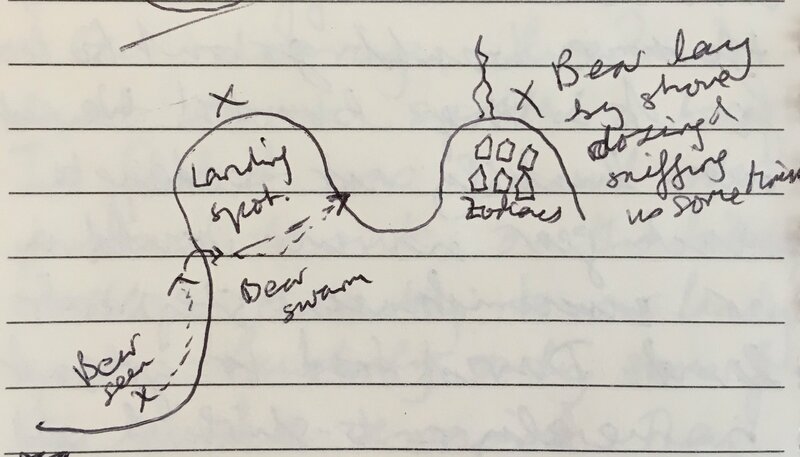 Michael, the expedition leader, had given us the following rule of thumb: if the bear is on land, you're in a boat (at a safe distance for both of you). If the bear gets into the water, you get back in the ship. Polar bears run and swim faster than a human being but are, luckily, slower than a Zodiac. We had the good fortune to see one polar bear on the Phippsøya shore. Stuffed with beluga whale, the rotten smell of which lay across the entire bay, it lay on a snowbank in a state of sheer digestive contentment. Occasionally, it lifted its head to squint at the hushed flotilla of tourists nearby. Then it would lie back down, stretch out one front leg a little, and apparently decide that that was enough exercise for a while. Its body language showed no signs of stress whatsoever. Polar bear on the beach at Phippsøya, by David Stark. An update from the Governer of Svalbard on the 30th July answered my question: the attack had occurred on Phippsøya. Ten days later, the dead whale might have been almost gone, but the island must still have been full of bears. Why would the MS Bremen decide on an excursion there? David suggested that, as they belonged to a different tour operator, they might not have received the news about the whale and landed in complete innocence. The other claim in the AP article that I found suspicious was that the attack and shooting had happened when tourists landed on the island. The MS Bremen and M/V Plancius follow the same, legally mandated procedure when making excursions on land, and for this reason I felt it was unlikely (though still possible) that any tourists were present at the time. All the guides who accompanied us on land were armed with a rifle and a flare gun. When the ship anchored near our destination, several guides would go out in Zodiacs to check the site from the water. They would then land, scout again for polar bears and station themselves at look-out points. Only then did we tourists put on our life-vests and head up to the M/V Plancius's Zodiac deck. The Governor of Svalbard's post confirmed my feeling that the guide was attacked while still preparing for the tourists' excursion. I think this point is important because the originally-published version of the story (based on a misinterpretation of this Norwegian tweet by the JRCC Northern Norway) is considerably more sensational than the actual events. This probably contributed to the social media reaction. This article about the attack and shooting (CN: image of the dead bear) discusses the connection between climate change and recent fatal human/bear interactions. Andrew Derocher, a professor at the University of Alberta who studies polar bears, said climate change is shrinking the ice bears usually hunt on, making them spend more time on land closer to humans. “These sorts of events are increasing and will likely continue to increase until at such point that the population of bears starts to decline precipitously,” he said. From photos posted of the bear killed in Norway, Derocher could tell it was in poor condition and “a skinny bear is a dangerous bear,” he said. Their physical condition decreases along with the ice necessary for them to hunt, said Derocher. This summer, the entire northern hemisphere, including the Arctic, suffered under a record-breaking heatwave. There were multiple meteorological causes for this, but the increased baseline temperature of the Earth due to climate change meant that the effects of any of these causes were greatly exaggerated compared to what would have happened several decades ago. On the 19th July, the M/V Plancius sailed north, past Rossøya, into the pack ice in the Arctic Ocean. In his presentation the night before, our expedition leader Michael showed us the ice chart for Svalbard—and the same chart from one year ago. The difference in ice cover was a shock. 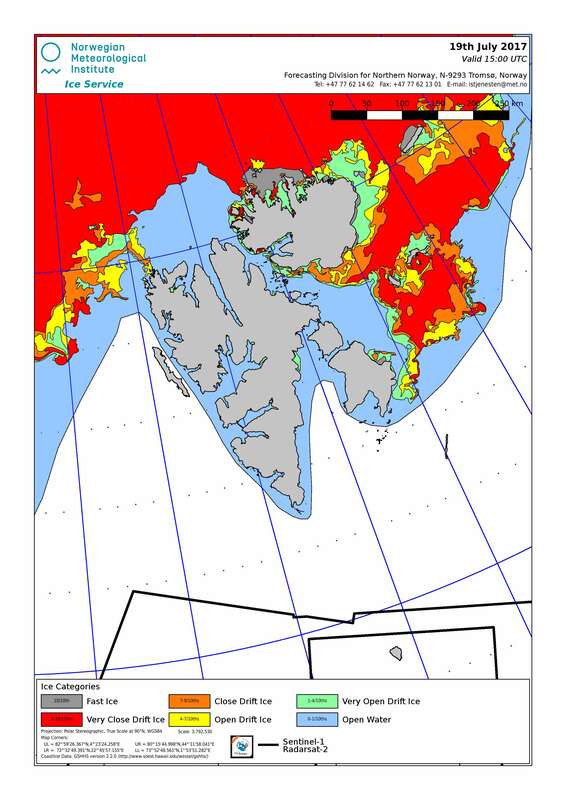 Left: Svalbard ice chart for 19th July 2017, Norwegian Ice Service. 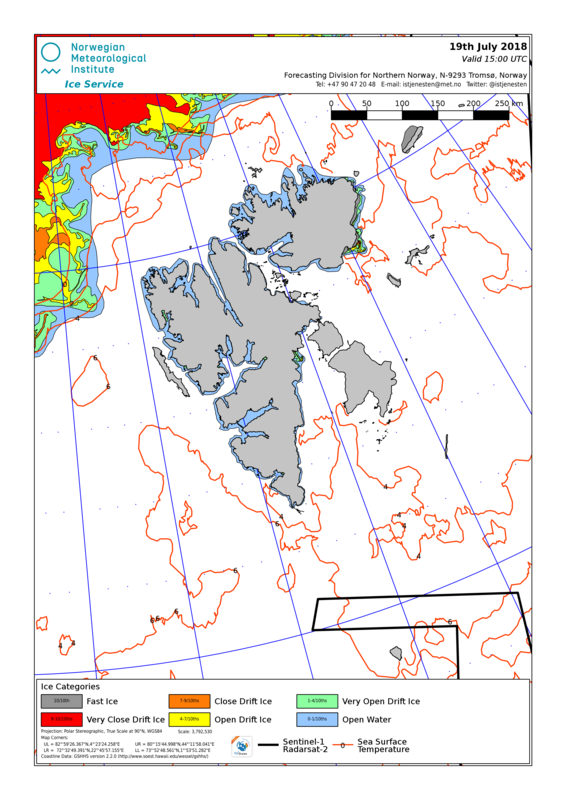 Right: Svalbard ice chart for 19th July 2018, Norwegian Ice Service. In the end, we had to sail to 82°N in search of the ice. This was the furthest north Michael had ever been in the M/V Plancius. The ice next summer may look much more like the chart from 2017, but we will have more and more years like 2018 in the future as climate change continues. I firmly believe that the group from the Bremen shouldn't have tried to land on Phippsøya. That they met the bear there seems to have been due to the combination of the heatwave, the dead beluga whale, missing information that other ships had heard, and sheer bad luck. Their behaviour after they landed, however, seems to have been exemplary (and just what our guides from the Plancius would have done). Upon being surprised by a polar bear, they made loud noises and fired a flare to warn it off. When the bear attacked one of them—in the head!—they had no choice but to shoot it, and to shoot a polar bear in such a situation means you must kill it. Otherwise, you just have an even angrier bear on your hands. Our visit to Phippsøya went perfectly, for us and for the bear. We were in a couple of other situations, however, where with bad luck we could have ended up in similar trouble to the guides from the MS Bremen. Once, hiking back to our landing point through mud and tundra moss, my group spotted rather fresh polar-bear tracks in at least two different sizes. Our guide remarked that he hoped the younger bear was old enough to be wary of humans, instead of just curious. We walked closer together and returned to the shore without seeing any bears in the flesh. A more exciting near-encounter happened on the first full day of our cruise. In the morning, we landed in Zodiacs at Signehamna. After a pleasant hike, the boats picked us up ten at a time and took us back to the Plancius. As the second-to-last boat set off to the ship, David spotted a bear on the shore, heading towards our landing site. The guide piloting the boat radioed to the remaining guides on the shore, who were waiting for the last boat to fetch them. Things got pretty tense. The guides drew near one another and made ready to jump into the Zodiac as fast as possible. They spotted the bear coming around the hillside towards them. It was still quite far off, but could have reached them far more quickly than they could have run away. As it continued to approach, coming within 200 or 300 metres of them, the guide Katja loaded her rifle and got the flare ready. Luckily, the bear was uninterested in the group of human beings. It went into the water instead, and swam across the bay in front of the guides. They were picked up with no problems, and shortly after we made another Zodiac excursion to observe the bear if we could—from the water! Polar bear on the beach at Signehamna, taken by me. Our guides had followed all procedures to the letter, procedures designed to maximise the safety of both people and bears, but polar bears are everywhere on Svalbard and the possibility that they will just appear can't be eradicated. The most likely event was what happened: the bear was not very interested in the guides right then. The second most likely outcome was that they would have scared it off with shouting and a flare. If it had continued to come closer, they too would have had to resort to shooting it. A hand-drawn map of the bear observation at Signehamna. Despite the obvious dangers of proximity between humans and polar bears, tourism rates very low on the list of threats to bears' survival. I believe that well-regulated and sustainable tourism can be a benefit to wildlife in the Arctic and other delicate ecosystems, by convincing local governments to preserve and protect them rather than simply extracting all the physical resources in the area. Svalbard, where coal mining has been nearly stopped, is currently a good example of this.